Based on the graphic novel by James O'Barr, this fantasy follows Eric Draven (Brandon Lee), a rock musician who is murdered along with his fiancée Shelly (Sofia Shinas) by a group of marauding thugs who terrorize the decaying city in which they live. 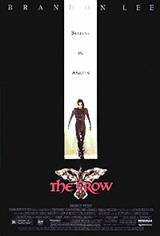 One year to the day after his death (which happens to be Devil's Night), a mystical crow appears at Eric's grave; Eric rises from the dead and, with the bird as his guide, goes on a mission to avenge himself against Top Dollar (Michael Wincott), the leader of the gang who killed him. Star Brandon Lee was killed while filming a scene in which he was shot with a shell from an improperly cleaned gun that was supposed to be loaded with blanks. Like his father, martial arts superstar Bruce Lee, Brandon was fated to enjoy his greatest popular success after his premature death.